Why does the Joystrings Harp exist? In 1988 a musician in Europe developed a special harp for a young man with Down Syndrome. We first saw that harp in Europe in 2001. By then, thousands of Europeans were playing them. We caught the vision of people all across North America, of all levels of ability, enjoying making music together on a real instrument for the very first time. As the original instrument was not available for export to North America, we obtained permission to build something like it here. And now, here it is for you to enjoy! Where can I see the Joystrings Harp? Since the Joystrings Harp is not sold through stores, we demonstrate it at public concerts where you can see and even play it. Joystrings Harp owners are excited about this instrument and love to show it off, and we may be able to connect you with an owner near you. We also do demonstrations for schools, retirement homes, church groups, and others. You can also see it by appointment - give us a call! How does the Joystrings Harp compare to the European original? The Joystrings Harp is nearly identical to the European original. We designed our own rosette for the front of the harp, and modified the upper track to accomodate longer pieces of music on multiple sheets. We also adapted it to the different size of paper used in North America. However, our music fits their harp (and vice versa). So if you own the European model, you can certainly order our music for it! Where is the Joystrings Harp made? It's handcrafted for Joystrings Music in Vancouver, British Columbia, Canada by an expert European-trained luthier, using fine North American and European woods and parts. How do I maintain my Joystrings Harp? Wipe fingermarks off the fine finish with a soft, clean cloth; never use detergents or solvents. Tune it regularly, especially when it's new. Use a tuning aid or our tuning CD so you do not over-tighten the strings. Carry your harp in our padded, zippered case. 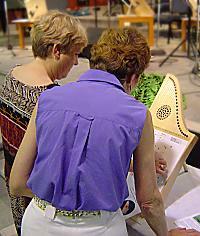 See your Joystrings Harp instruction book if you plan to send your harp as checked baggage. What if you don't sell the music I want to play? The Joystrings Harp is ideal for writing your own music, whether it's an original composition or something you've heard on the radio. Slide a blank sheet of paper into the harp, find the first note by trial and error, and make a dot under that string near the top of the page. Find the next note and mark it a little lower down, and so on until you capture the whole piece. Now you, or anyone else - with or without experience - can play that piece again. And you thought you couldn't write music! More questions? Contact us for answers.